Take one look at Greenville and all you’ll see is a friendly American Town. You might not think it’s anything special, but you’d be wrong... While the world’s governments stood idly by, a secret organisation called the Novas Vira was preparing to defend Earth from the Martians. 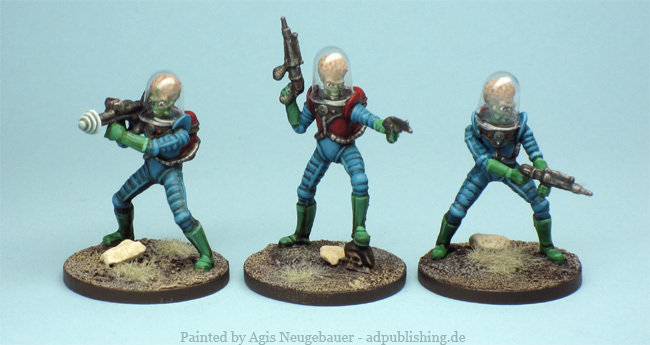 In hidden locations deep beneath the planet’s surface, they built a secure communications grid using reverse-engineered Martian technology supplied by a mysterious benefactor.” from the Mantic Miniatures homepage. I pledged on the very successful Mantic Kickstarter and received my reward recently. The miniatures are a good mix of great rewards and some real glitches. The basic are Martian Soldiers are much to my liking!